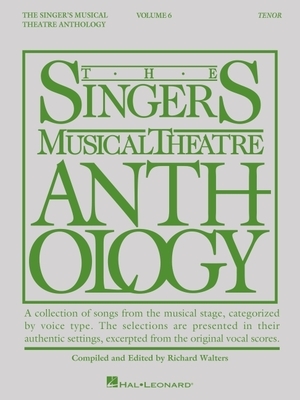 Singer's Musical Theatre Anthology - Volume 6: Tenor Book Only (Paperback) | The Drama Book Shop, Inc.
(Vocal Collection). The world's most trusted source for great theatre literature for singing actors Each song is in its original key and has been chosen particular for each voice type. The selection of songs comes from classic through contemporary shows and the book includes notes about each show and song. Contents: THE 25TH ANNUAL PUTNAM COUNTY SPELLING BEE: My Unfortunate Erection * ALADDIN: Proud of Your Boy * BABY: I Chose Right * BIG FISH: Stranger * THE BRIDGES OF MADISON COUNTY: Wondering * It All Fades Away * BRING IT ON THE MUSICAL: Enjoy the Trip * CARRIE: Dreamer in Disguise * CATCH ME IF YOU CAN: Someone Else's Skin * ELEGIES: When the Earth Stopped Turning * FALSETTOS: The Games I Play * FAR FROM HEAVEN: I Never Knew * FIRST DATE: In Love with You * A FUNNY THING HAPPENED ON THE WAY TO THE FORUM: I'm Calm * A GENTLEMAN'S GUIDE TO LOVE AND MURDER: Foolish to Think * Sibella * HONEYMOON IN VEGAS: Isn't That Enough? * IF/THEN: You Don't Need to Love Me * THE LAST FIVE YEARS: If I Didn't Believe in You * THE LITTLE MERMAID: Her Voice * A MAN OF NO IMPORTANCE: The Streets of Dublin * MEMPHIS: Memphis Lives in Me * NEWSIES THE MUSICAL: Santa Fe (Broadway Version) * NEXT TO NORMAL: I'm Alive * There's a World * ONCE: Leave * Say It to Me Now * PIPPIN: With You * SWEENEY TODD: The Contest * VIOLET: Last Time I Came to Memphis * Let It Sing * WONDERLAND: One Knight. Click here to hear most of the songs from this volume on YouTube.